The first is to write your message in secret code. This is called cryptography. The second is to plant your message within a larger, non-secret communication. This is called steganography: hiding a message within an image, right out in the open. Illustration is essentially a steganographic art. Rather than using the words of a writer, illustrators convey a message by folding it into an image. They use a variety of symbols, brush strokes, colors, facial expressions, body language and other techniques to communicate meaning that writers convey verbally. This picture has a text which you can certainly read, but the marvelous frowns on the young "orphans" add a whole non-verbal layer of humor and intelligence to the message. Try conveying this level of frustration with mere words! Finally, here is a neat example of the illustrator's art of staging and body language. The stooped posture of the interviewer, the wild gesticulations of Cowboy Wally, the arc of beer tracking the movement of his gesture; this all requires thought and planning. These pictures by Baker are beautifully designed but they are also highly intelligent in a non-verbal way. This is different from the writer's form of intelligence, but it is just as rare and deserves just as much respect. In recent postings about words and pictures, I have commented on the current rash of artistic geniuses who can't draw (or who, in the words of one commenter, are simply "writers who draw.") These artists don't communicate with steganography, they use cryptography. Their message may be concealed in the metaphor or allegory or symbolism of their written text, but it is rarely found ingrained in their drawings. Whenever I write on this subject, I receive fatwahs and death threats from fans of Maus, Persepolis, Jimmy Corrigan, Fun Home and other fashionable works. They would like to dismiss skill or talent in art as merely "slick," but the roots of quality in art are too ancient to be so easily dismissed. Perhaps such critics sell pictures short because they can't read the steganography in art. Excellent post. While I'm sure this isn't an original thought, this last week while trying to explain to a friend why I was more attracted to, say, Kay Nielsen than Kandinsky (not to rag on Kandinsky, just illustration vs. abstract) I realized that great illustration just makes me want to see more art by the same person, whereas modern art just makes me want to know about the artist. I think the same thinking applies, at least in my case, with such works as Persepolis, Maus, Jimmy Corrigan, etc... for me they lack resonance without the author's bio/life appended to them. One can easily dismiss your "critiques" of the aforementioned comics by bringing to your attention that drawing and cartooning aren't the same thing. This is, in a word, fundamental, but why you can't seem to understand it is something else entirely. Anonymous, I'm afraid I'm going to need a little more help on your point. Cartoons certainly incorporate drawings, but I agree they are not "the same thing" as a drawing. Where does that take us? 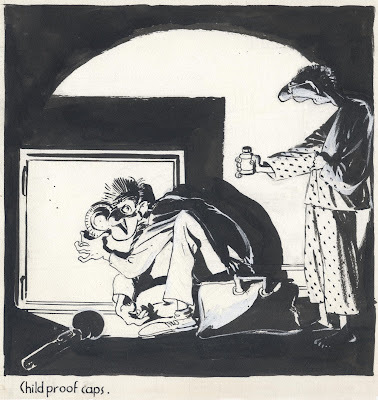 In your post DRAWING WITH YOUR BRAINS you wrote "Artists such as Art Spiegelman and Chris Ware seem to be the current darlings of the illustration community, but largely because of the content of their message. Let's face it-- their drawing is just plain lame." First of all, you will have to clarify whether you actually meant 'the illustration community' because I do not now nor have I ever seen them as darlings of that community. Secondly, that statement seems to be explicitly self-contradictory (the illustration community loves someone because of the content of their message?). Yet at the same time it seems to emphasize your belief that comics are some form of illustration (which they are not), a belief that is highlighted further by your recent post which paints them in a shade of, if not didactic, than certainly some sort of message-carrying vehicle. The problem with your argument - why I see it as easy to dismiss almost entirely - is that you cast your net too wide, and in this specific case judge a certain medium by another's standards. The functional thrust of comics is that of narrative - not so with illustration or in your broad category of "drawing" - in other words, time, whether implicit or not, is an element that is absent from the "static" forms you focus on more often than not. It would be like analyzing a film by studying freeze-frames. If you want to criticize comics, you would be better suited to study the whole wheel as opposed to the cog. On the other hand, if your intent is in fact to study that cog, that which you call drawing, then aside from striking me as being almost pointlessly reductionist, your singling out of the works you have comes across as simply reactionary. Certainly not designed with this ultimate effect, cartoonists will readily admit that a single panel of their work, alone, does not work, on its own... nor is it meant to. On a similar note, something which I touched upon in my earlier post, if you realize that to apply the standards of drawing, in its illustrative manner, to those of cartooning in the medium of comics, it becomes practically a self-fulfilling prophecy. Anonymous, you have put your finger on an issue that has long baffled me, and I hope you will stick with this long enough to fill in the gaps for me. I have often heard that the "time" factor in cartooning makes it different from "drawing" or "illustration," so it must be evaluated by a different set of criteria. But the time factor is hardly unique to cartooning-- Here is a sequential illustration by Norman Rockwell; Here is sequential art from ancient Egypt; Here is sequential gallery painting. Here is sequential drawing for animation. You will notice that in each of these examples (and thousands of others) the "cog" in the wheel is beautiful by itself. Each Rockwell vignette is masterfully done. Each Egyptian hieroglyph is lovely. These artists didn't plead for an exemption from traditional standards of artistic excellence because of the time element. They would have been fired if they did. When the current crop of cartoonists announce that their work should be judged by different standards, people accept their proclamation like the ipse dixit of the new Pythagoras. Why are you so easily persuaded? Why isn't time just one of many tools that any artist (whether an illustrator or a gallery painter or an animator or a cartoonist) uses to solve an artistic problem? For example, is the choice between a static or sequential approach more important than the choice between color or black & white, or between realism and abstraction, or between bold and delicate? Perhaps you can explain to me why time, out of all these factors, is apparently the only one that relieves the artist of the obligation to draw well. PS-- when I wrote earlier that Ware and Spiegelman were "the darlings of the illustration community," you are right, I did not mean they were the darlings in the eyes of the illustrators. I meant they had been selected from that community to have their work exhibited in museums like the Whitney and reproduced in coffee table books by the Smithsonian. I meant that the New Yorker and Time Magazine swoon over them. Of course, these same establishment critics turned up their noses at generations of beautiful artwork because it was deemed too commercial. I think Ware and Spiegelman are decent guys, but the critics who loudly proclaim them geniuses give me the creeps. David, I do not think that the element of time is exclusive to comics, clearly, but rather the specific function of time as being a vehicle of narrative is one of the elements that distinguishes comics as a medium all its own. To arrange static images of any kind in sequence will, given the nature of the way our minds work (and to which I will have to yield to more learned scholarship), create an almost unconscious urge to search for a narrative, no matter how disparate those images may be. Thus, this sequence may very well fit the definition of sequential narrative, and thus comics if you go by that definition, but the question arises whether the whole is greater than the sum of its parts. In other words, what may make rather marvelous static images in their own right arranged in sequence (with the intent of narrative or not) does not necessarily make for good comics. I believe that given that the tools of the "comics-maker" are, or rather can be, in part, an accumulation of other disciplines, it is easy to see comics as simply a collection of those seperate disciplines and judge them by any one of those, as opposed to something all its own. You even illustrate (no pun intended) this contention rather well when you asked "...is the choice between a static or sequential approach more important than..." This is not a question of approach, if what you mean by "sequential approach" is comics, but a choice between two different mediums. "Will I write a poem, or a novel?" Well, there's quite the difference there... in both cases. On the point of comics being seen as a collection of disciplines, I often think of comics and cinema as cousins in this sense, being something of an inverse of one another on the question of time. Similarly, filmmaking incorporates disciplines that predate it: writing, photography, staging (theater), etc., but to judge the whole by any one of those parts (i.e. to judge a medium by another's standards) can often lead to the kind of frustration you express. So, for example, you can look at a film script by the standards of prose and be thoroughly dissapointed, but what makes good writing in film (in a sense "cinematic writing") may not, nor should it, fall under the parameters of literature. On that point, the critic Andre Bazin argued (and I believe this example goes to the very heart of the argument), to take the loose plot of a hungry man sitting at a table of food, you can either lean to the side of theater and not use editing, but instead show the drama unfold uncut, or you can use a unique property of cinema, editing, and juxtapose looks of hunger, so to speak, with shots of the food, etc. to convey the idea. This would, by definition, be utilizing the medium of cinema, but the question Bazin asks is, ultimately, does that add anything? Therein lies the rub. To take, for example, freeze frames from an action sequence in a John Ford film, you can analyze them by the standards of photography, and they may rise or fall on those merits, or lack thereof. You can also arrange them in sequence and have what could be classified as comics. But what would ultimately be missing is the summation of its parts, in other words the action. Unless one is specifically studying cinematography, or choreography, I do not see the point in being reductionist in that sense, and especially not in judguig the whole by a single part. Earlier, I used the phrase "comics-maker" and I chose it carefully because he or she can utilize various forms in creating comics - it can be drawing, or painting, or cartooning, or even photography, or a mixture of a few or several. Surely, if you take your Rockwell example, each of those images can stand on their own if you judge them by the standards of illustration or drawing or whatever have you. That still does not address the overall issue of whether it succeeds as a work of comics. If you look at other works by Ware and Spiegelman, for example, or even other incarnations of the same work as far as the latter is concerned, you will see that not only have they utilized different styles and forms, but, more to the point, they have both consciously and specifically chosen to utilize the style of cartooning they have in the works you criticize them of. Therefore, you must ask yourself why, and judge each by its own standards, as, I believe, you must do with all works of art. This is where, in my opinion, the argument must begin. I have not heard or read cartoonists arguing that their work should be judged by different standards - they may very well have, I simply have not really read much as far as interviews or proclomations are concerned, so it's not a question of being easily persuaded. These are simply standards to which I hold all works of art. I think what is really the issue here is that so few illustrators or cartoonists produce work which genuinely exults in the power & joy of drawing well. Anonymous, I am content to stand or fall by the answer to Bazin's sensible question, does the art "add anything?" If cartooning is a medium comprised of both words and pictures, I assume it is only because the pictures, whether individually or cumulatively, are supposed to contribute something that words alone could not achieve. When I look at the work of Winsor McCay or George Herriman or Jack Kirby or R. Crumb, I understand what the visual component adds. But I am not sure how the rudimentary images in Maus or Fun Home or Persepolis "add anything" other than to catch the attention of unsophisticated critics at Time Magazine who are still titillated by the novelty of "adult" content in a "childish" medium. Perhaps you can help me understand what the art adds, but it seems to me that the words in these works are way out ahead of the images, like a film with a great script but mediocre cinematography. I suppose one could argue that bland, uninspired placeholder drawings "add something" by creating artistic tension when juxtaposed against emotionally jagged content. But looking at the comic art of earlier generations (which went utterly ignored by the museums and the pulitzer committees) I just feel, under the test offered by Bazin, that art could add so much more than just serving as a foil for the words. Mahendra, you are absolutely right. I have a large backlog of pictures to share, so it is time for me to stop bloviating and get to it! Well, here is my point of view for this subject (I'm french, sorry for my english). The comics have a great problem for the "intellectuel" critics: it's figurative. They are comics artists very interested in the drawings and some others much more interested in the story (the drawings are just a convenient way to tell a story). I agree with Mr Apatoff: Spiegelman is not a great drawer. Maybe he is a great comics artist (I'm not a huge fan of his work but can see the importance of it) but his drawings are just efficient for the story he tells. The problem of institutionnal critics is that they have no culture of figurative drawings so they call genius the things they like and they consider the drawings are great only because they like the whole thing (some years ago there was an exhibition of Spiegelman's Maus work in Paris and newspapers were talking about his genius drawings. 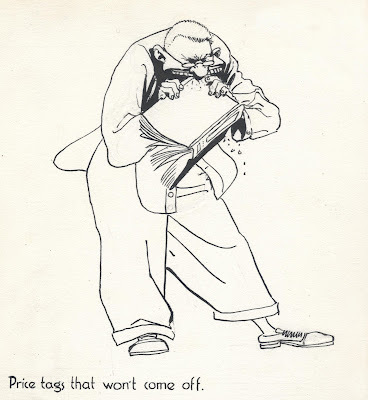 So not only the comics were genius but the drawings were considered as a great work). As comics author I am very interested in drawings. I like this post because there is a reflexion about how to make the difference between great comics artists and great drawers. 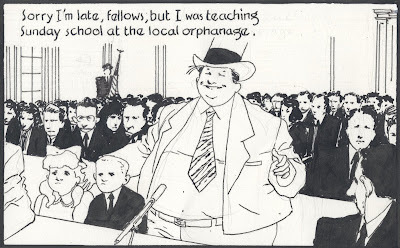 In France, everybody in the medias speak about Satrapi or Sfar but I'm much more interested in the work of Blutch or Blain. I will finish with an interrogation about Chris Ware. I think he cannot be put in the same bag than Satrapi or Spiegelman because his obsessions and the way he works put him above them as an artist. I'm not a great fan but very impressed by his inner world. Li-an, your English is impeccable and your reasoning is even better. I enjoyed your blog very much. I fight the same battle on the animation front almost every day. The argument that gets me the maddest is when they say that South Park or The Simpsons wouldn't be as funny if it was drawn expressively... No, it wouldn't be as funny. It would be FUNNIER. Keep up the fight for visual literacy. OK. Now I've read all the comments. I'll add my 2 cents. The "critics" of comics are almost always writers, not artists. They understand the words up there in the balloons perfectly, but they don't always have the ability to understand the technique underpinning the drawings. That's why writers are more willing to forgive inexpressive drawing in comics than cartoonists are. When it comes right down to it, the element that sets cartooning (encompassing both comics and animation) apart from literature and live action movies is the fact that comics are DRAWINGS that tell a story, and animation is DRAWINGS that move. If you remove visual expressiveness from cartooning, you're left with less than a half a loaf- it might as well be told in a different medium. Words are very useful for telling stories. Used in novels and poetry they create their own magic. But cartooning and illustration are by definition visual storytelling. This doesn't mean that comics shouldn't have dialogue balloons. It means that the dialogue should support the visuals, not serve as a replacement for them. I'm always surprised to hear people argue in support of bad drawing in cartooning. The funny thing is that artists who draw poorly aren't usually the ones defending lack of visual expression. They either express a desire to improve their drawing, or maintain diplomatic silence on the issue. It's always seems to be writers who argue that drawings don't matter. Jeez, you guys are really coming across as conservative fuddy-dudies in this nostalgia for a bygone age. Worse still, Stephen Worth's comment about those cartoons rings painfully similar to the bellows of critics who will always look for 'that which is not there'; essentialy upholding a belief that if it's not their way it's not good, or effective, or whatever the case may be. An animator is effectivaly the equivalent of a cinematographer in film - to say that they should all employ this vauge "expressiveness" is simply to impose your own will over artists. In essence, what you are doing is looking at things through the wrong end of the telescope and not judging a work of art, but judging a work of art relative to your own tastes and opinions. And whoever makes such a comment as to it "wouldn't be as funny" - well, that comment is neither here nor there, just as an assertion that it would be funnier is. Let me talk a moment about Chris Ware's work, as I feel comfortable and familiar enough with his work to offer some thoughts (I haven't read MAUS in years, didn't care much for Persepolis and didn't even finish it, and haven't looked at Fun Home) Chris Ware's cartooning is pared down almost to the level of iconography, essentially relying on the inherent language of comics. At the same time though, close analysis will show just how expressive his purportedly "cold," "distant," or whatever superficial term only a quick and narrow-minded glance will yield, linework in fact is. In any case, his rationale, as I see it, for doing this is for the same reason you could argue that the Rockwell example fails as a work of comics. Ware doesn't want you to spend time on each single image because he is not trying to make a collection of beautiful images that add up to a story (For example, think how difficult it would be to read a book if each letter of every word was an illuminated letter). In choosing his cartooning style, he effectively conveys the visual information "needed" in a carefully considered composition (both individual frame and overall) to create a visual rhythm; a narrative rhythm, while at the same time not detracting from the actual narrative. Thus you could say that this both adds to the work and doesn't detract from it. And that's just touching upon his more straightforward, dare I say traditional, narratives. The example you chose to illustrate your point initially was from early in his career and admittedly bad (even by him) - I'm sure I could find you work by any artist you'd like from early in their career that didn't come up to snuff. To say his work has matured since then would be an understatement. Anonymous, I'm not sure you can call it "nostalgia for a bygone age." After all, I write admiringly about artists such as Kyle Baker and Ashley Wood, who are younger and more recent than Art Spiegelman or Chris Ware. In fact, Spiegelman and Ware have long been the established choice for moribund audiences at the Smithsonian Institution and Time Magazine. Hard to get less radical than that. On the other hand, I (and apparently a few other readers of this blog) are the true revolutionaries, confronting the establishment with evidence of their artistic hypocrisy and intellectual hubris. We speak truth to power. Just look at some of my mail and you will see that you take your life in your hands by criticizing Ware. I've got nothing against constrained and minimalist art (as opposed to detailed or expressive art). I think that David Lynch's The Angriest Dog In The World was brilliant. I just don't think the people we've been talking about draw minimalist art particularly well. As for Chris Ware, I do admire him for his work ethic, his sincerity and for his innovative design work constructing an elaborate world of his own. He may even be a fine writer, but around here we have been primarily focusing on artistic quality, and that's why Ware gets dissed. Honestly, I don't understand the argument that Ware doesn't want us to linger over details in each panel, because the pace of Jimmy Corrigan seems excruciatingly slow to me. 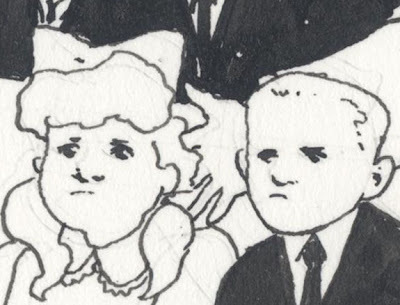 Why draw four identical panels in a row, if you're not trying to slow time down? Your inability to understand deliberate pacing and rhythm are no critique of Ware, and woe to an age where 'slow' is a call of criticism. I think Stephen Worth's comment about the critics of comics almost always being writers is dead-on, but at the same time you are occupying the polar opposite position and seem better suited focusing on static images, or exclusively drawing. (Of course it's your right to do as you please, but such myopic assessments of Ware's work as a whole can only extend as far as... well, as far as this blog). You come across not as revolutionaries but as reactionary contrarians in, firstly, heeding anything that comes from the "critics" at Time or whichever other rag you seem to hold as a criterion of artistic opinion, and secondly, in choosing to single out, coincidentally I'm sure, only the most prized of works. Yes, your calls of nakedness may naturally bring attention, but as far as Emperor Ware is concerned, such calls will just as easily land you in the loony bin when he is seen to be fully decked. It seems to me that those who so easily dismiss his work are, and will continually be, unaccepting of anything that doesn't fit their own parameters of art (or, as I stated in my previous post, looking through the wrong end of the telescope), always looking for something that isn't there as opposed to what is. In short, your thoughts on a work of art will always be relative in that sense. When approaching any work of art, you must give yourself over to the pacing/rythm/style/whatever of the artist and begin from there. This can be quite jarring when approached in relativity - when dealing with artists of almost opposing styles. It all sounds earily familiar to me. "Critics" who similarly dismissed Kubrick's work as cold, slow, emotionless, misanthropic, etc. were looking for what wasn't there instead of what actually was, and worse, expressing the kind of relativity I mentioned. These criticisms, if I can even call them that, of both artist's works, come from people who are either too accustomed to, or need to be told how to feel; who need their hand held through a work of art. In short, the more "expressive" the better - that way one can surrender their mind and be given over to sentimentality and clear-cut messages. And you're right. David Lynch's The Angriest Dog In The World was incredibly well drawn. Right. Anonymous, as I said earlier, anyone who dares to criticize Chris Ware is taking his life in his hands. You may be right, I may be "myopic" and "incapable of understanding," as well as a "reactionary contrarian" who belongs in the "loony bin." But I promise my comments were not intended to anger you, and I do thank you for this dialogue. As myopic as I am, I think I do understand your point about "looking for something that isn't there as opposed to what is." You should consider the possibility that someone could focus on what is there and still find it unimpressive compared to other, lesser known art. And by the way, I really do believe that the art (and the script) in The Angriest Dog in the World is superior to the art in Jimmy Corrigan. I'm sorry-- I just can't help it. 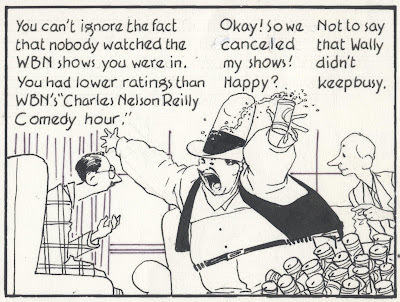 It isn't reactionary to expect cartoons to have great cartooning in them. Even my 85 year old mom can look at today's Sunday pages and any Sunday section from the 20s or 30s and see that quality in cartooning has taken a nosedive. What's wrong with asking art to be expressively drawn? That doesn't mean sentimental or sappy, and it doesn't mean that I need to be told how to feel. It means that the artist has something to say and he is communicating it using the medium to its fullest potential. When I look at a live action film or a comic strip or a painting or an animated cartoon, I want to see skillful technique used with variety to put across an idea in the most eloquent way possible. There's nothing eloquent about xeroxing the same panel over and over and just swapping in new dialogue balloons. Let's be honest. That's a cheat. It was a cheat when the lousy cartoonists of the past did it, and it's a cheat now. It takes serious mental gymnastics to justify the culture of subtraction we live in today. But critics with no sense for the integrity of the medium are doing a swell job of it! This is the sort of mind numbing "culture" that brings us painters that paint incredibly detailed and incredibly meaningless paintings of knickerbocker toys, cartoonists who badly silkscreen posters of roughly traced day-glo Preston Blair drawings to advertise punk bands, and crude animated cartoons created by non-cartoonists without a single bit of animation in them. I don't want to have to search for apologies for lack of skill/talent/technique when I consider a work off art. I just want it to communicate using the unique aspects of the medium the artist chooses to convey his message. I apply a similar set of criteria for judging creative products that artists have used for centuries to judge their own work... variety, expressiveness, skill, balance, rhythm, form... I know that's a way of discerning that goes back hundreds, if not thousands of years, but how is that being a "reactionary contrarian"? To me, it's thinking like an artist. We need more artists in the world today... REAL artists, not pretend ones. Hey! I finally have something to contribute! A) THANK YOU for the great scans of Kyle Baker's original work. I love looking at original Cowboy Wally art. Kyle's art makes me want lock myself to the drafting board and finally learn to draw. It's terribly inspiring. "...artists such as Kyle Baker and Ashley Wood, who are younger and more recent than Art Spiegelman or Chris Ware." Baker has been around for a lot longer than Ware. Oh. And Baker's a better writer too. Comedy is much harder than faux retro nihilism. And I say this as a Ware fan. C) Thanks again for the wonderful website, Mr. Apatoff. I have been thinking about this post for days, so thank you for the intellectual aesthetic stimulation. Worth the price of the ticket. It occurs to me that when "steganography" is present, when comics are drawn expressivly, the characters are more than place holders because they are acting. In the best old cartoons, or comics (I'm thinking of, for instance, Windsor MacKay or Max Fleischer,) everything is alive and expressive. The chairs frolic or menace, the bed stretches or trots, the pots and pans dance or bang someone on the noggin. They are expressive actors in the drama as full of subjectivity as the characters we usually think of as animate, like people or animals. Every inch of the frame is being used to it's fullest to express not only plot, but emotion and subtext. In the non-expressive examples you cited, some of which I'm not familiar with, some of which I'm very familiar with, this kind of actor presence is missing. The other thing the expressive cartoons do is to put the viewer into one or more of the characters internal subjective realities. If one character is huge and looming, it's because another character is experiencing her that way, or because the artist wants the viewer to experience a particular subjective response. When all the characters (including the pianos) are graphically equal, the viewer is not led to a subjective emotional response. It's like watching a movie where every scene is framed from the same distance by a motionless camera with full depth of field. There could be cinematic reasons for this, of course, but they would have to be intelligently and purposefully applied to carry the emotional tone of the film. Thanks for a very stimulating and educational blog. Steve, I agree with you-- especially your point that we need real artists today. In the past, some of the greatest periods of artistic flowering (including the Italian Renaissance) have taken place in times of greatest social upheaval and peril. I think we're doing pretty well on the peril side, but this brand of art is not up to the task. Jason, thanks for writing and I hope you will continue to do so. Thanks also for the correction on Baker. I'm glad you like these pictures; I admire his work too and I have a bunch more I'd like to post (although I must say, he seems to have multiple artistic personalities, and I like some much more than others). Liza, thank you for a most eloquent and thoughtful contribution to the discussion. I think you have advanced the debate. Hi, just came in from the ASIFA blog. I read through the comments and this post, and I get the impression that it's not what some artists do that riles you up, but the fact that they become the critics' darlings, and therefore they become trendsetters. For the record, I liked both MAUS and PERSEPOLIS, can't find enjoyment in Chris Ware's work other than the ingenuity of his layouts, but my favorite artists are guys like Ash Wood, Paul Pope and Bryan Lee O'Malley. And now, the kudos: reading your blog is turning out to be a refreshing experience, and I might not approach my work the same way again.